One girl against the Mafia; Basquiat’s hunger and humor. Long ago it expanded into other places, but to think of the Mafia is to think first of Sicily. Partly, of course, this is because of the many films about the Sicilian Mafia, so many that they constitute a genre, and none of which, as far as I have seen, has been less than good. Now comes The Sicilian Girl, which sustains the genre in expected and unusual ways. The expected ways, shamefully gripping, are, as always, the threats and businesslike killing. The less usual ways are in the film’s factual basis. In 1991, the diary of a seventeen-year-old girl, which she had kept for five years, helped to bring some Mafia big wheels to justice. (At the start of the long trial, the prosecutor had to fake the girl’s age as eighteen so that she would be a legally responsible adult.) What she learned during those five years and what happened during the trial are the coiled substance of the picture. The director Marco Amenta had already made a documentary about the case, and has returned to the subject presumably to depict nuances of character. This is Amenta’s first feature, and he has savored the chance to use what his subject provides: as he tells his sinister story, he explores a Sicilian village in all its crannies and vistas of charm, and he draws Sicilians in affecting colors. The title character, Rita Mancuso, was born in the village of Balata. Her father is Don Michele, a local dignitary, respected and proud. (Some names of people and places have been changed.) When he walks through the village square with his family, he acknowledges greetings with a regal wave, and some people even kiss his hand. Rita and her brother Carmelo adore him. But early on a shadow falls. There is a Mafia murder in the village, and when Don Michele investigates, there are implications we do not expect. Then, because of his relative independence from the bosses, he too is killed. Subsequently, so is his son. Rita, only eleven years old, sets her course for vengeance, far-off though it may be. Surprisingly, her mother urges her to accept, to forget. As the film proceeds, it unfolds the reasons for the mother’s stony reasoning. Though she is a minor character in the story, she is a complex and enlightening one—a woman saturated in the past and probable future of her society. Through the next six years, Rita keeps a specific journal of crime in her village, moving toward the day when she is old enough to act. When she is seventeen, she manages to reach the office of the chief prosecutor in Palermo, who, after investigating, rejoices in this wealth of evidence and puts Rita in a witness protection program. But the tenor of Rita’s crusade has changed, which the prosecutor helps her to see. Her father, the appealing Don Michele, was somehow involved in the Mafia drug trade. So Rita now understands that her campaign is no longer for justice in the purest degree but solely for personal vengeance. Whatever her father and brother may have done, whatever their misdeeds, they were murdered. This alteration in purpose shakes her, but it doesn’t deter her. During her long isolated days in Palermo, enjoined by the police to leave her apartment only to buy food, she nonetheless indulges in a flirtation, later in something more serious. Partly because this is foolish, it is credible. The ending of this story—the trial and its results—are a matter of record; still, I’ll let the film bring the news. I’ll say only that some of the accused are convicted, and that the mother has a final angry gesture. Amata has found a youngster named Veronica D’Agostino for Rita who is perfect—that is, she is just good enough to be completely convincing. Anything of an extraordinary performance would, in this case, distract from the verity that the film needs. A French actor, Gérard Jugnot, plays the prosecutor with plentiful reserves of strength and patience. (Query: was a French actor needed because no Sicilian would take on the role?) Lucia Sardo makes the mother a woman who has many reasons to be the way she is. Mirco Garrone has edited the film sinuously, and Luca Bigazzi’s camera brings us the beauty of the places where these terrible things are happening. The perennial dilemma of the Mafia persists. In Sicily and Italy and elsewhere, there are always some incorruptible people fighting it—officially and personally. These people know before they start that they cannot win. One mafioso or another may be eliminated, but Cosa Nostra will continue. No police force or government anywhere expects to eliminate crime completely, but here is a place where the government seems to be facing not a crime ring but a giant shadow government of (presumably) comparable strength. In that sense, The Sicilian Girl is one tense chapter in a continuing conflict. Jean-Michel Basquiat: The Radiant Child is a documentary of a pyrotechnical career. The subtitle was the title of an article written about Basquiat when he was twenty-one, celebrating his meteoric rise as an artist. The film begins, appropriately, with a sequence presenting its setting, Manhattan’s SoHo in the 1970s and early 1980s—the district between Houston Street and Wall Street, which in those years was a kind of carnival of artistic outburst and unconventional life. Certainly those aspects have not utterly disappeared in SoHo, but in those days some of us other Manhattanites felt that we were living in a normal house where, in a downstairs room, a lively party was continuously rollicking on. Tamra Davis, who made this film, has quickly brushed in the way things looked. Just one omission: there is no mention of the theater activity down there at the time, Off-Broadway and Off-Off Broadway, one of the most prolific periods in American theater history, which influenced and was influenced by everything that was going on around it. Anyway, this is the locale to which Basquiat came in 1977, when he was seventeen. Davis, who has since directed eight feature films in Hollywood, shot some interview footage with Basquiat in 1985, put it away, and only lately decided to use it as the base of a full-length documentary, filled out chiefly with latter-day interviews of people who knew Basquiat back then. The phrase “talking heads” is once again shown to be a foolish pejorative if the heads talk interestingly, which they certainly do here. The story begins with what is still a considerable mystery. 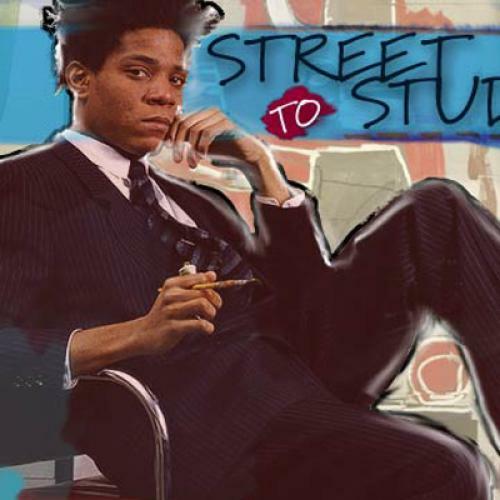 Why did Basquiat go to SoHo in the first place? Brooklyn-born, the son of an accountant in an average middle-class family, he suddenly decided to alter his life completely. He had been interested in art early on, and his mother encouraged him; still, it is astonishing that this high school senior simply left home and threw himself onto the streets of SoHo. This he did quite literally, sleeping and eating where he could. It is almost as if he discovered his true habitat in SoHo. He got some money from odd jobs and by illustrating postcards, which he peddled in restaurants when possible. He also began to add to the abundant wall art—graffiti and drawings and much else—that festooned the area. Here is where dealers begin to structure his story. A friend saw some of his wall work and postcards and said that if Basquiat did some drawings, he would sell them. Both things happened. In time—a relatively short time: this whole story is only ten years long—a dealer named Annina Nosei said she would take him on if he did some paintings. He said he didn’t have the money for canvas. She gave him some money. He bought the canvas and made the paintings, and she sold them. In further time, a big Swiss dealer, Bruno Bischofberger, telephoned Basquiat and asked to become his dealer, and the artist eagerly accepted. Thus, along with the personal account, we get a sketch of the process by which art careers are made. It would be coarse and false to say that price determines popular opinion; still, it is notable that whenever an artist’s quality is noted, price is usually also mentioned. (Instance right here: in 2007 Sotheby’s sold a Basquiat piece for $14.6 million.) Apparently, whatever one’s view of the quality of an artist’s work, big money at least authenticates it as a subject. I offer no opinion of Basquiat’s art other than to say—apropos of the many examples in the film, some of which include crossed-out graffiti—that it seems clear that with the right sponsorship, some patrons would respond. Many of the interviewees use the word “masterpiece” about Basquiat works. One of the critics says that Basquiat took “all the street energies and translated them into high art.” One can certainly sense the energies. What is inescapable in the film is the effect of Basquiat himself. He is good-looking, quick, witty, and underneath his lack of pose is some touching self-respect. He had many friends who loved him, including Andy Warhol: in 1996 Julian Schnabel made an enacted film about him. He had many lovers, some of whom speak fondly of him. When he visited Los Angeles, which he did often and where a gallery featured him (and where Davis filmed her interviews), his work sold well and his company was sought. Drugs entered his life—it’s not clear exactly when—and eventually became a fate. The physical pattern became almost predictable, except that the glimpses we are given of him along the way, in Davis’s footage and other clips, are always fresh-faced. He died of an overdose in 1988, aged twenty-seven. The only negative voice about Basquiat’s work in the film comes from Hilton Kramer, who is present presumably out of Davis’s sense of fair play. But, whether or not one likes the work, Davis’s film fascinates as the account of an aerial adventurous spirit. His life took courage and hunger and imagination and, somewhere, humor. It was an ascendant life, brief though it was. What’s more, he had charm.